Perhaps one reason why it is easy to fall out of the habit of personal journaling is that we ascribe more emotional energy to it than it requires. If we assume every entry needs to be an eloquent and thorough reflection on the day’s events, we will likely encounter evenings where we feel too tired to bother with writing in a journal or diary. A favorite journal of mine, given to me by a dear friend. I brought this one to Georgetown. One purpose for journaling: consider all those rants you want to post online and write them in a journal first. If they still appear reasonable on paper after a little while, then post them to social media. That allows some time to refine your thoughts the old fashioned way to improve the quality of discussion. Proverbs 25:8,11. Interestingly, the words “journal” and “diary” are both rooted in Latin words meaning day, or daily allowance – diurnalis and diarium. But such accounts logging the happenings of the day can be simple as a sentence (or in some cases incomplete sentence) noting what you prepared for supper, or what movie you went to see, what you saw when out for a walk, or what you noticed in the news. We are so used to being able to look up media records (social and national) that this might not seem important, but this simple log style comes in surprisingly handy when there’s something you need to remember about the week or month (like how long ago leftovers were put in the refrigerator, or when you started reading a book or planting a garden). It reminds you of how much you’ve actually been accomplishing when you feel like you’re getting nothing done, and gives you a sense of perspective when busyness makes keeping track of time confusing. Thomas Jefferson’s Garden Book (see http://digital.library.upenn.edu/women/sadler/bloom/bloom.html). Social media does provide an outlet for these sorts of logs, and having them available for interaction with family and friends is entertaining. But keeping handwritten notes for yourself is nice, and research indicates that we learn and remember better when we write things by hand. A style of brief, handwritten record keeping was routine during the Founding generation. You’ll find a farm wife describe her chores and a bout of “ague” scrawled in a few words, and Thomas Jefferson (who kept journals for different subjects) record the weather in Philadelphia on July 4, 1776. I like to use the date spaces in my Levenger Circa Daily Planner planner to record the events of the day instead of scheduling the day (I do scheduling on a separate sheet). Inspired by Edith Holden’s The Country Diary of an Edwardian Lady, I’ve always enjoyed nature journaling when I can, and I like to combine that with another journaling tradition delightfully described by Stephen Masty at The Imaginative Conservative: The Commonplace Book. Unlike keeping a scrapbook with wedding invitations, newspaper clippings and happy-snaps of your nieces, a commonplace book is a scrapbook of ideas, and they have been kept and filled since Classical times. It is, in a sense, the lazy man’s diary written only when inspiration strikes…At negligible cost and just a little effort, Saint Augustine and the Founding Fathers, Old Possum and Russell Kirk and Professor Tolkien, and moderns such as Brad Birzer and others can all reside together in suitably splendid accommodation on your coffee-table, ready to delight and provoke with great ideas both you and your great-grandchildren. George Washington’s famous Rules of Civility collection was probably written in a commonplace book, and Jefferson’s commonplace book is cited when scholars investigate his worldview. 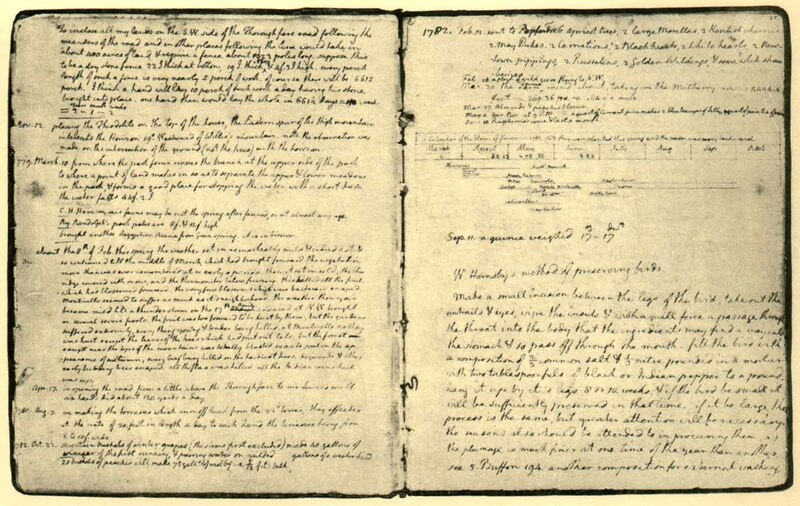 Excerpts from John Adams’ commonplace book can be viewed at the digital archive of the Massachusetts Historical Society. I keep a few notebooks in which I write down Bible verses, excerpts of political speeches, professors’ lectures, dialogue from movies (and my own script ideas), song lyrics, funny quotes from friends and siblings, artistic descriptions of locations, etc. with some sketches and paintings here and there. It’s both a release and enrichment for the mind – at any time of the day or night. Try journal keeping with this extra simplified approach, and see if it comes more naturally!